The Silent Auction Catalogue will be available online early April. By Phone – Call 416.593.7769 X358. Please leave a detailed message with your name and phone number, and one of our Bridge Event committee members will contact you. By Fax * – Complete the Bridge Registration form and include payment. Fax your form to: 416.591.0213. Mail In * – Complete the Bridge Registration form and include payment. 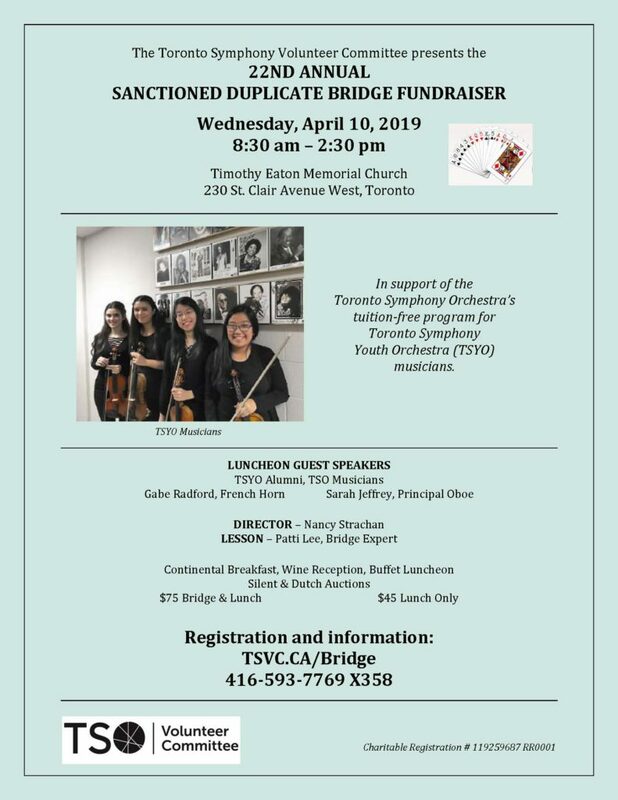 Mail your form to: TSVC Bridge Event, 500-145 Wellington St. W., Toronto ON M5J 1H8. * You will receive confirmation of your fax or mail in registration within one week of receipt of your completed form. This fun spring event raises funds for the Toronto Symphony Orchestra and its education programs: Morning with the Symphony open rehearsals for students, the Young People’s Concerts, and the Toronto Symphony Youth Orchestra’s tuition-free enrollment. We are delighted to offer a duplicate bridge lesson with Patti Lee. Patti is a dynamic and engaging speaker with impressive credentials. She is a Silver Life Master, an accredited ACBL teacher and a Tournament Director. Patti has taught thousands of students over the years. Currently she is teaching at a number of private clubs in Toronto as well as on cruise ships. We are sure you will enjoy Patti’s lesson and no doubt your bridge will improve as well. We are also excited to have two TSYO alumni/TSO musicians as our luncheon guest speakers. We look forward to welcoming TSO French Horn Gabe Radford and TSO Principal Oboe Sarah Jeffrey. We are pleased to announce that Saffron Catering Company will be our caterer again this year. We will be offering many exciting items in our silent and Dutch auctions, and we know you will find several interesting and tempting items on which to bid. The silent auction catalogue is expected to be online by early April. Parking is available on side streets although car pooling is encouraged. The venue is also conveniently located near public transportation. 8:30-9:00 am – Bridge Registration. The event registration check-in for duplicate bridge players opens at 8:30 am. 9:00-9:40 am – Duplicate Bridge Lesson with bridge expert Patti Lee. 9:45 am-12:30 pm – Duplicate Bridge Game. 12:45-2:30 pm – Wine Reception and Lunch with luncheon guest speakers – TSYO Alumni/TSO Musicians. Registration check-in for wine reception and lunch only participants begins at 12:00 noon.